IF you believe your mum should dine like a queen this Mother’s Day, the Tiffin Restaurant at Weil Hotel in Ipoh is the place to go to. Committed to celebrating a mother’s unconditional love, the restaurant’s executive chef Eric Soong and his team will offer a lavish international buffet spread on this special day, where all mothers will receive a complimentary mocktail. Families can tuck into a wide variety of seafood, salads, soups, local and international dishes, carving items, pasta and scrumptious desserts. Among some of its noteworthy dishes is the Lobster Risotto. It is mixed with a special kind of cheese, and the end result is a lip-smacking mixture that is just nice without being overly creamy. Another delectable item on the dinner menu is the Pan-Seared Seabass, which tastes the best when dipped with the home-made tomato puree, and the mini onion and tomato slices it is served with. 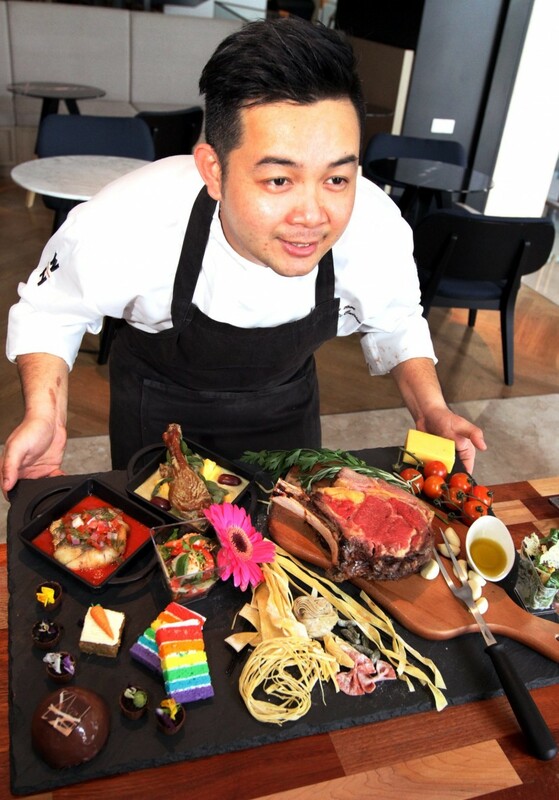 Grand feast: Tiffin Restaurant Chef De Cuisine Lee Choon Boon showing off the array of food available in their upcoming Mothers Day dinner menu, which includes the Slow Oven-Roasted Beef Ribs, Pan-Seared Seabass, Thai Curry Duck, and colourful, tasty desserts. A sure winner on the list is found at the carving station — the Slow Oven-Roasted Beef Ribs. Its tender, succulent meat tastes just as great as it looks. There are also the classic favourite such as Caesar’s Salad, and exotic selections like Thai Seafood Salad and Thai Curry Duck. 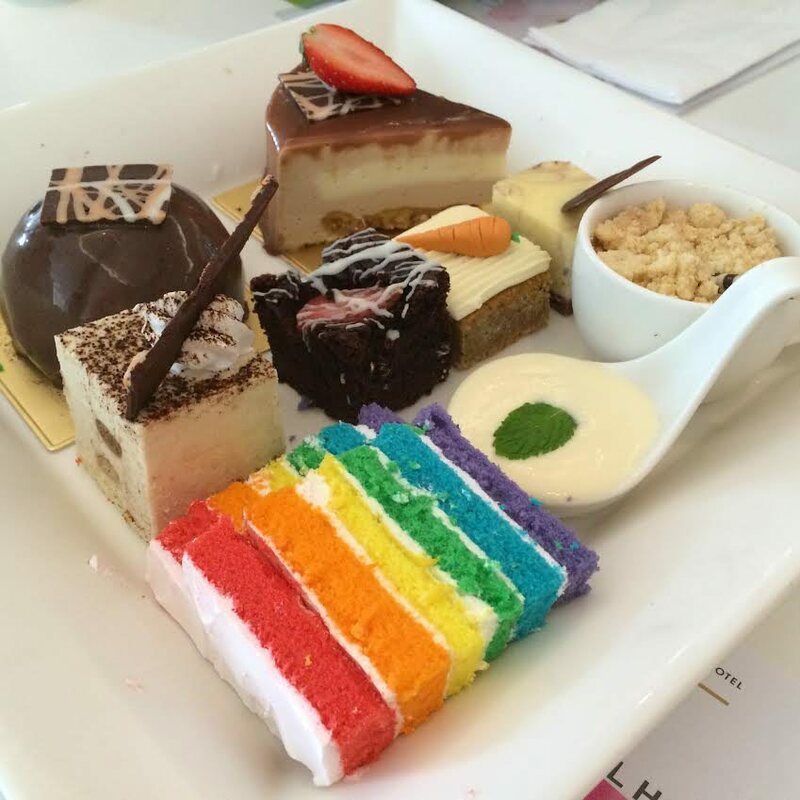 Dessert lovers will love what Tiffin’s talented pastry chef Sarah Choo has whipped up, which is a tasty assortment of sweet treats like Tiramisu, Hazelnut Latte Cake, Carrot Cake with Cream Cheese Frosting, and the Apple Crumble Pudding. The Chocolate Dome Cake is a rich, heavenly concoction one must sink their teeth into, while the Rainbow Cake is also highly recommended as each colourful layer is laced with different fruity flavours such as strawberry, lemon, orange, kiwi and yam. This special dinner, exclusive on May 10, is priced at RM68 nett per adult, and RM34 nett for children aged six to 12 years old. It is free for children aged below six. Diners will also have the option to add RM60 nett for a free flow of selected wine and beer. For mothers who prefer contemporary Chinese cuisine, bring her along to the hotel’s signature Chinese restaurant, Yuk Sou Hin. Master chef Chung Ho Shi and his culinary team have come up with three eight-course Mother’s Day set menu to celebrate the special occasion. It is available for lunch (12pm-3pm) and dinner (6pm-10.30pm) on May 10. The set menus are priced at RM988 nett, RM1,199 nett, and RM1,388 nett respectively for a table for 10 people. Some of the highlights are the Marinated Salmon with Coffee and Sea Salt, Crispy Eggplant Topped with Chicken Floss, wholesome soup of Braised Bird’s Nest Soup with Chicken and Mushroom, exquisite Steamed Marble Goby Fish with Superior Soy Sauce, and more. For diners taking more than one table, a 10% discount will be offered. For reservations an details, call 05-208 2228 or e-mail enquiries@weilhotel.com.